I keep seeing several threads where people are commenting about the stamp sets that they hardly ever use or sets that they've never used, and so that got me to thinking that I should start inking up my unloved stamps as well. 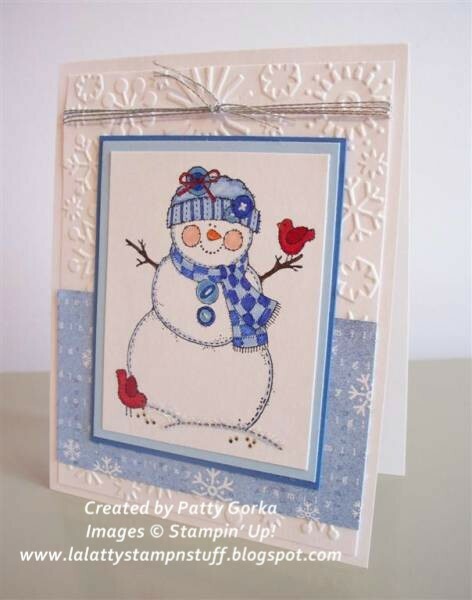 This snowman image is from an older SU stamp set called Stitched Santa. I'm glad I kept this set because I was going to trade it on one of the PIF (pay it forward) threads a few years ago, but then I didn't. I stamped my image using black stazon ink and then I colored it using my SU markers. It was my daughter's idea to make the birds red and I think she was right. It really gives my card that sort of 'pop' that it needed. My background was embossed using my cuttlebug snowflakes embossing folder (from the Winter Wonderland set). I decided to add some SU light blue decorative paper that I found in my scrap bin and then I finished my card off with some sliver cording along the top and a little bit of glitter just along the bottom of the snowman. Tomorrow I plan on sharing another snowman card I made from an even older SU stamp set that I have so be sure to stop on by! Make it a great day! Very cute. You made the stiched snowman look good. I have a soft spot for snowmen and this one surely hits it! Love him and how you made him so spectacular! Wonderful snowman! I love how you colored his scarf and hat. The snowflake embossing folder goes perfect with this image! Holy Stitched Snowman! I have this old set too! Wow! Great Job!